Below is a transcript of Medicine Mondiale founder Sir Ray Avery's presentation on medical innovation and applied knowledge at TEDx Auckland. Andy and I were talking just before I came on the stage, and he asked me what I was going to talk about. I said, I'm an innovator, I'll work it out. But I have to tell you that the T Shirt is from Hallensteins, the socks are from Mumbai, the shoes are from Thailand, my watch is from China, my glasses are from Nepal, I'm your global fashion statement. Which explains why I'm not also on Facebook. What I'm going to talk about today is two things really, my innovation from an academic scientist to an applied scientist, and my journey in that road to make a difference in the world, and, one of the things that happens with New Zealanders is that we're sequestered away from the rest of the world, and how does that impact the way that we see the world and how we think? So, each year, an American organisation publishes some results from "the world's most innovative nations." When you look at the 25 nations that are actually published in this annual review, you'll see for instance that India is 0.2%, our good friends in Australia are 1%, and the highest scoring nation is actually South Korea, with 2.55%. New Zealand doesn't get a mention, because we're 'special'. Because we're hidden down here in what I like to refer to as the Antarctic Riviera. No one knows we exist. For example, Colin Murdoch was a New Zealander who invented the disposable hypodermic syringe, which changed the world. Without it we'd have pandemics and all sorts of terrible things happening. To understand the way of thinking behind this development, you need to understand the difference between academic knowledge and applied knowledge. And applied knowledge is what we're good at. Because we're only 5 million people, we can't delve into great depths of science, but we can watch something practical happen, and take that knowledge and adapt it. And that's what we're good at. So when Colin Murdoch was sitting at his kitchen table one day, he was a pharmacist from Timaru, great friend and a mentor to me, he was sitting there and he took a BIC pen apart. And he thought, that's a nice bit of plastic. If I could put a plunger in there, I could make a disposable hypodermic syringe. So, he went off into his garage, switched on the lathe, and that's how he made the disposable hypodermic syringe. And it changed the world forever. One man, that nobody ever heard of. And that's what New Zealanders do. Colin is an inspiration to us all, and he was an inspiration to me in terms of how I change from being what could be seen as being an academic scientist, to an applied scientist. In England I was brought up in orphanages, and I was always interested in science, and I would pull things apart. And as a young boy, I used to go to the wreckers yard and get bicycles and then repair them and put them together. And in doing so, I learnt about bicycles. And my ambition at the age of seven was to own my own bicycle shop. But fortunately I moved on from that, and did science degrees, and moved into the commercial fundamental research establishments in the United Kingdom. And at the age of 26, I was one of 23 world experts on the hill reaction of photosynthesis. Great. And I was waiting every time I went to a dinner party for someone to bring it up, as in what's the role of metallo proteins in the reaction of photosynthesis? And it never happened. So I was forced into the conclusion that I should actually become an applied scientist, and work out how I could use applied science to make a difference in the world. And I was also fortunate enough to come to New Zealand, where knowledge is not sequestered, knowledge is actually open source. People will help you with any of your endeavours. What I'm going to talk about now is how I went through that transition from an academic scientist, to a slightly dangerous social entrepreneur, who is actually a little bit mad, in the sense that he now believes that, with a little bit of help, I can change the world. 90% of the world's wealth is concentrated in what we refer to as the developed world, and only 10% of that wealth is in developing countries. And of course, the burden of disease is in those countries where they don't have any money. As a scientist I realised I had a social responsibility to try and address those issues, but it wasn't a catharsis that happened overnight. In fact it happened quite by accident as you'll see. But what we're talking about here is also a huge commercial opportunity for commercial development. 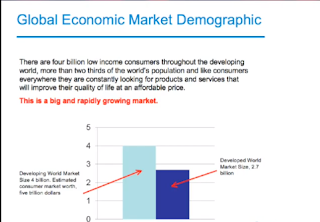 The developing world market is an emerging market, and if we can somehow engage with that market, we can actually make the world a much more egalitarian place. For instance in china in 2020 there's going to be a huge middle class population that we can sell stuff to. And we've got to try and find some way to engage with these countries, and make some product offerings that address the inequities. The more time I spent in developing countries, the more I realised that they are very innovative countries, and they can adapt to any technology they absorb. 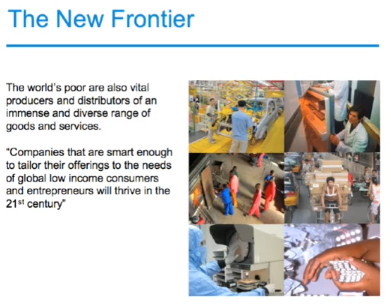 So companies that are smart enough to employ some of their intelligence to targeting products for the developing world market, are going to prosper, because that's the new frontier. It's the new wild west. There are global marketing opportunities in healthcare, education, telecommunications and manufacturing. To give you a practical example of how we can learn from developing countries, if you go to Nepal, for instance, you can rent some time on a cellphone. But the little trick that I love is that not only in Nepal can you buy a single cigarette, you can buy a puff of a cigarette! So somebody saw a marketing opportunity, for even the lowest paid person having a purchasing power. aNd if we can recognise that we can make differences. And what happened to me was, in the early 90s I met Fred Hollows, who was trying to set up some blindness intervention programs in Eritrea and North Africa, and Nepal. And Fred approached me and said 'Can you build these laboratories for me in Eritrea and Nepal?" And I said well I'm not sure, but at any rate I'll go and have a look, and I'll give you a report. And at that time, and even today, there were 20 million cataract blind per year in the world. Everyone in this room will eventually get a cataract if you live long enough, but in our country, you'll go to a surgeon in Remuera, pay him $3000 and he'll fix it. But in developing countries that surgery wasn't available. A patient with a mature cataract, before and after surgery using Medicine Mondiale's Intra-Ocular lens technology. The way that developmental agencies often deal with these issues is to fix the fundamental problem (the guy can't see), so in 2002 the WHO dealt with this by giving people a pair of afocal glasses, to replace the lens of the eye. It was a terrible operation, and if you lost your glasses you were clinically blind. Fred knew that if you could make low cost intra-ocular lenses, that you could fix that problem, and so he sent me off to Eritrea at the end of the 30 year war. I'd never seen war up close and personal at all, but when I got to Eritrea at the end of the 30 year war, there was nothing functioning. No water or cement works, and there was a burnt out schoolhouse which Fred said was going to be the state of the art Intra-Ocular lens laboratory. Building the laboratory was obviously a technical task, these laboratories have to be made to CE mark standards, and that was a big ask in a country that had been at war for 30 years or so. So I asked the guys when we were trying to install some very sophisticated HEFA filtration systems, "Have you got a metal fabrication plant somewhere where we can get some metal and fabricate it into brackets?" And he said Mr Ray we have the tank graveyard. And the problem with this was that it was about 3kms out of town, and I remember being taken out there in a van, and we were walking across this field, and I could see several acres of burnt out 4wds and tanks. And suddenly the manager of the factory stopped and said "Mr Ray, inadvertently I may have taken you into a minefield. "It was the longest 300m of my life getting out of there. But after some time, we did in fact commission this laboratory. And as you can see, it's a state of the art facility which makes intra-ocular lenses for the international market. This innovation lead us to reduce the cost of each unit down to around $5 each, and as a result around 15 million people worldwide have had their sight restored using this technology. So that shows what you can do in countries with no resources, but with a lot of tenacity. So we though what other health care issues can we look at? And so we started to look at what were the big issues and big killers in developing countries, and I set up Medicine Mondiale to address those issues. And the other problem we discovered was that the most common medical procedure in the world, intravenous infusion therapy, and in developed countries you have expensive controller pumps, but in developing countries you'll get a 50 cent roller clamp device, where 2 or 3 mms of movement will be the difference between your life or death. So there was a hidden pandemic, where millions of people were dying just because they got the wrong does of medicine, and it turned out this was a major killer. The problem was exasperated with young children, because they needed so small amounts of medicine, that these roller clamps couldn't administer that amount. The solution was a little plastic device we invented which could clip on to the outside of a drip set. Now, you can easily and accurately dial up the correct flow rate. This is also re-usable as it clips onto the outside. So when you spread the cost over hundreds or thousands of patients, it costs virtually nothing. And that's the trick that you need to come up with in developing countries, is to come up with solutions that they can afford. This unit will improve the health of over 2 billion people. Another big killer is malnutrition. When I came out to New Zealand I would go to these barbeques and someone would squeeze a bit of kiwifruit on the steak to tenderise it. We found out that if we applied a little bit of this kiwifruit enzyme to meant products, especially chicken, we could come up with a solution to protein energy malnutrition, so we developed a range of products using waste products from abbatoirs and the kiwifruit industry, which we can put into a little bag which costs 25 cents, that we can get to millions of kids in developing countries. It's that innovation, the way we work as New Zealanders, that makes it possible for us to change the world. But I'm a commercial animal as well as a scientist, so we took the protein stream from that product and applied it to the sports nutrition market, where sports nutritionists can use this technology. 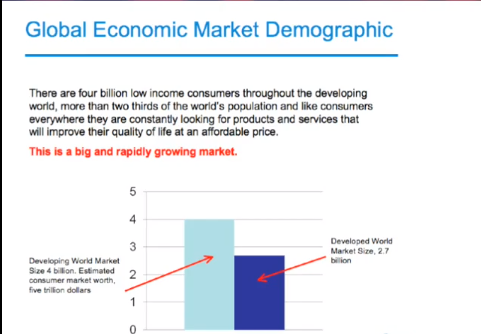 So we can make money out of the first world, and we can sustain the distribution in developing countries. What I want to impress upon you more than anything tonight, is that Medicine Mondiale has no employees. Not a single one. So how did we do this? All of this technology was developed by New Zealanders for free. They donated their time. And that is why we're special, and that is why we can take our place on the world stage. Tim Norton: So Ray Avery, what's your background? Ray Avery: I trained as an analytical chemist, and then I became a pharmaceutical scientist, and I realised very early on in my career that being an academic scientist wasn't for me. So I became an applied scientist. I'm the kind of guy who pulls a watch apart, finds out how it works, and then tries to apply that technology to some other paradigm. Tim Norton: So what are the major things that have happened to you over the last 10 years? Ray Avery: Well I realised that one person actually can change the world. I invented a little bit of technology that makes low cost intra-ocular lenses, and that enabled us to get sight to about 11 million people. So that's a big deal in terms of healthcare delivery. And I realised that if I could do that, then I could look at other problems in a developing world setting, like infant nutrition, the low quality delivery of incubators, and a whole lot of nutritional technology wasn't being addressed. So we went into our laboratory, and worked out how to do that. Tim Norton: So what does that mean for you now? What have you left to set up? Ray Avery: Well we've got a factory in Nepal which is making nutritional products that will change the world for millions of kids, we're making low cost incubators, and currently we've got a product which is an intravenous controller, which will revolutionise intravenous therapy worldwide. A lot of kids die simply because they get the wrong amount of medicine, so we've made a little clicking device which can adjust the flow very accurately, the equivalent to say a $2500 syringe pump, but it costs $6. So what we do is we make technology accessible. I think what the problem is in the medical world is that multi national companies basically sequest the science. My job is to get it out to the general population. Tim Norton: So you're going into an industry and you're really lowering the cost and shaking it up. What challenge does that bring with it? Ray Avery: Well you look under your car, to see if there's a bomb. But no I think the issue is that, in developing countries people die because they don't have access to healthcare that's affordable to them. So for instance the intra-ocular lenses we made cost $300 about 20 years ago, and we've reduced that price now to about $4. 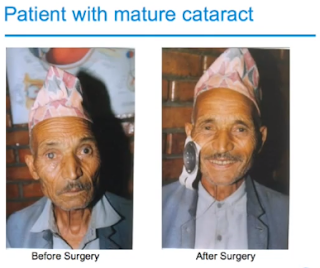 So that means that a sherpa in nepal can get his eyes fixed, and see and contribute to society. Whereas before he would have been blind for the rest of his life, because it's a whole year's salary to get the operation. So making healthcare accessible makes life worthwhile for me really, because otherwise I would be an academic scientist working in a laboratory, and not being a very interesting fellow really. Tim Norton: So making all this real world change, I think we're all pretty familiar with some of the challenges, but what are the real challenges in going forward for you and what you're trying to do with the world? Ray Avery: I think the big challenge is to encourage other organisations to actually apply the same kind of technologies that we are, and to get other companies in New Zealand to make offering that are useful for developing countries. So for instance, even if you're making something like Bluebird chips, you could make an offering for the developing country which is actually nutritious and good for them, and actually get that marketed. If you think about companies like Coca Cola, they're ubiquitous. So you can make products that actually work, and get delivered to the end users. I think the challenge is, I can't do everything, but I can encourage people to start thinking about how they can engage their company to help making medical products that are accessible to people. That way, we end up with an equitable world, and it's a safer world because we don't have all these separate activities going on. People get unhappy in developing countries because they're basically poor, and they can't feed their kids, and they get sick and they die. So we can't have this isolated society where we roll around in great looking cars while 80% of the world is disadvantaged. So my job is to try and bridge that equity gap. Tim Norton: Absolutely inspirational. Congratulations on your contributions to New Zealand and the world Ray. Ray Avery: Thanks a lot. One of the major causes for infant fatalities in the developing world is acute diarrhoea, caused by poor nutrition and severely depleted immune systems. This acute diarrhoea breaks down the infants' stomach lining, making it impossible for them to process food and absorb vital nutrients, and so the problem compounds itself, and in many cases leads to death. By working with leading nutritional scientists, Sir Ray Avery and the team at Medicine Mondiale have developed Proteinforte Infant Nutrition Formula. This special formula is made up of pre digested high quality amino acids, and so can be readily absorbed by infants, even those whose stomach linings have been broken down, in order to provide life saving energy and nourishment. Once the formula was developed, the only question remained: Would the infants actually eat it? In order to answer this, Sir Ray Avery personally visited childrens hospitals in Nepal, and was very relieved to see the children eating the nutiritious formula. In order to raise funds for the ongoing development of the Liferaft Infant Incubator, Medicine Mondiale has gathered a group of enthusiastic young volunteers to help with a grass roots fundraising campaign. One of Sir Ray Avery's key philosophies is that "no one is smarter than all of us", so this is a great opportunity for these young people to put their heads together and find innovative solutions for Medicine Mondiale's campaign. Using their knowledge and enthusiasm for media, PR and social media, this group will look to raise awareness of the Medicine Mondiale cause, and promote donations from a wide range of people. 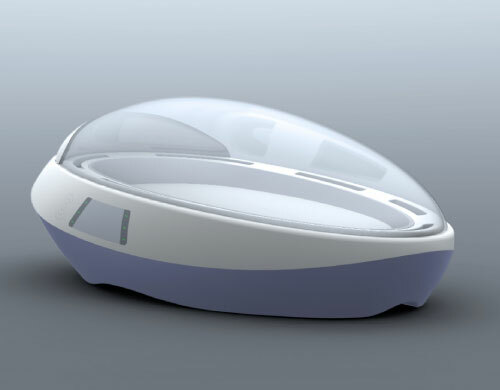 These efforts will help to move the Liferaft project forward, and in doing so bring a faster solution to thousands of infants in need of this technology around the world.